With over $10,000 in prizes (in addition to $500 in Apple Gift Cards, a Kindle Fire and a super trendy Jawbone Jambox) and 27 competing teams, the resulting hacks proved diverse, eclectic and sometimes just for the lolz. The best part: watching strangers come together for a exhausting 30 hour race to the finish line. The weirdest part: the over abundance of caffeine-infused chocolate covered candies. Without further ado, here are official winners and their apps. 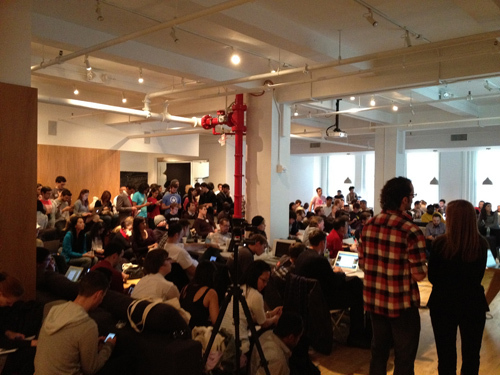 Wander Mapper takes home $2,000 for their awesome Foursquare hack. Developed by Jeff Escalante, Jeremy Fisher, Keenan Cummings and Tyler Brock on their stealth project Wander Beta, Wander Mapper let’s you create an illustrated version of your Foursquare neighborhood. The result is a custom-illustrated map, consisting of a series of districts corresponding to top-level Foursquare categories e.g. food, nightlife spots, arts and entertainment etc. The more places a user checks-in to in each district, the bigger the buildings in that district become. If a user hasn’t checked-in to many places in a district, we’ll recommend a guide to help them better explore it. Users become eligible to guide upon reaching Level 3 in a district. Sign up for Wander Beta to get your own Wander Map. Eatpager won $2,000 for the best use of Location. Developed by the Onepager team (the About.me for businesses), this hack utilizes Foursquare and the NYC government data to help hungry users explore restaurants nearby. One particularly interesting feature is how they display official sanitation ratings, which allow you to view specific health violations. Building.ly scored a handful of Jawbone Jamboxes and $2,000 for creating the best community building app, while utilizing the AMEX Open Forum API. Building.ly hopes to offer “the best deals on the best stuff optimized for where you live and work.” They provide residential and office buildings with a food ordering/delivery platform that allows local businesses to create custom deals for people who live and work nearby. It was developed by Jason Culbertson, Alessandra Nolting, Quin Kennedy, Sean Levin, Noah Smith and Aaron Smyth. Give Building.ly a test drive here (GA’s offices are the only ones in their system for now). …Poorsquare is a simple Web app with a simple mission: to point you to the free stuff in your neighbourhood. It leverages Foursquare’s location, places and deals databases to achieve its purpose in life. It is a pretty interesting idea and has been executed nearly to perfection, and it must be beneficial for the brands offering these freebies as well. The easier it is for you to find the one bar that will give you a free beer for walking in, the more likely you are to do just that. You can learn more about Poorsquare or visit their site via poorsquare.us (NYC only for now)! To view a complete list of all the hacks, visit the official list. For more hacked up goodness, check out the results of Foursquare’s Hackathon, Hackday.tv and Photo Hack Day, all hosted recently at the glorious General Assembly. American Express has partnered with a number of New York City’s most successful startups to both collaborate with and further power its OPEN Forum initiative. Read more about American Express’ involvement with New York’s tech scene here.